Not to be confused with Changzhou Island, an island in Guangzhou, China. Cheung Chau (Chinese: 長洲, lit. "Long Island") is an island 10 kilometres (6.2 miles) southwest of Hong Kong Island. It is nicknamed the 'dumbbell island (啞鈴島)' due to its shape. It has been inhabited for longer than most other places in the territory of Hong Kong, and had a population of 22,740 as of 2011[update]. Administratively, it is part of the Islands District. The village of Cheung Chau, viewed from the north. The bay of Tung Wan is on the left and Cheung Chau Typhoon Shelter is on the right. Geographically the island is formed from two mostly granite masses joined by a tombolo. With an area of 2.45 square kilometres (0.95 square miles), the island is therefore "long", hence the name as translated from Cantonese is "Long Island". Thus, it is redundant to say "Cheung Chau Island". The island is dumbbell-shaped, with hills at the northern and southern ends and the settlements concentrated in between. The central part of the island is well developed with shops and houses. The lane-ways are so narrow that normal motor traffic is impossible. Instead, there are small motorised trucks officially termed "village vehicles". For example, there are small specially designed mini-fire engines, ambulances and police cars. Residential areas also exist on the hills of the north and south. Traditionally the island was a fishing village and there are still fishing fleets working from the harbour. However, in recent years the island has become a major tourist attraction, offering a mixture of sandy swimming beaches, seafood cafés, and traditional Chinese culture. Under the terms of the 1898 Second Convention of Peking, the New Territories and 200 smaller islands including Cheung Chau were leased to the United Kingdom for 99 years. At that time, Cheung Chau was mainly a fishing village; it had more residents living on junks than on land. Cheung Chau had already been settled by people from other places in Southern China; for example, Hoklo, they are mainly fishing people; Hakka people; Chiu Chau; and Yue Ca. The island slowly evolved into a commercial hub with merchants selling supplies to the local fishing people, boat repair and fishing gear as well as the place to do business for fishing people and small farmers of other nearby islands like Lantau Island. From 2000, a spate of suicide cases (most of them by "burning charcoal") took place inside rental holiday homes on the island. Hong Kong Chinese-language newspapers soon dubbed the island "Death Island" and stories concerning apparitions appeared in the wake of news about the succeeding suicides. In 2005 a local councillor Lam Kit-sing (林潔聲) proposed a "suicide theme-park" to be built to capitalise on the island's now macabre reputation. Those plans were quickly ridiculed and subsequently rejected. Soon after, the choice of Cheung Chau for would-be suicides tailed off. Rock Carving on Cheung Chau. Hung Shing Temple. Built in 1993, it is managed by the Chinese Temples Committee. Kwun Yam Temple (觀音廟) aka. Shui Yuet Temple (水月宮) aka. Chi Kung (子宮), near Kwun Yam Wan beach. Built before 1840, and dedicated to Guanyin (Kwun Yam), it gave its name to the nearby bay Kwun Yam Wan. 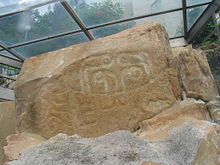 Rock carvings located near Tung Wan Beach were reported by geologists in 1970, and are declared monuments of Hong Kong. This 3000-year-old rock carving is located on the east of the island, immediately below the Warwick Hotel. It consists of two groups of similar carved lines surrounding small depressions. Temporary altar built during the Cheung Chau Bun Festival. The annual Cheung Chau Bun Festival is a festival which includes a parade of floats, most famously including young children dressed as famous characters doing impossible balancing acts. It lasts three to four days and attracts tens of thousands of visitors to the island. There are currently three primary schools in Cheung Chau, including C.C.C. Cheung Chau Church Kam Kong Primary School (中華基督教會長洲堂錦江小學), Cheung Chau Sacred Heart School (長洲聖心學校), and Kwok Man School (國民學校), and two secondary schools : Buddhist Wai Yan Memorial College and Cheung Chau Government Secondary School. Formerly there were 7 primary schools including the Fisheries Joint Association Public School, Shun Dal Primary School and The Cheung Chau Government Primary School and three secondary schools including the now closed Caritas Saint Paul's Secondary School. Although there are more people living on Cheung Chau now than ever, the fertility rate throughout Hong Kong has dropped significantly leading to many school closings throughout the city. Lee Lai Shan, a windsurfer, won Hong Kong's first Olympic gold medal in 1996. That Olympic gold was also Hong Kong's last Olympic medal since in 1997 Hong Kong became a Special Administrative Region of the People's Republic of China and now competes in the Olympics as Hong Kong, China. A First Ferry ferry at Cheung Chau Ferry Pier, within Cheung Chau typhoon shelter. First Ferry operates ferries service between Central pier number 5 and Cheung Chau. The ferries run approximately every 30 minutes depending upon time of day. Schedules on Sundays and public holidays differ from weekdays. The trip of about 20 kilometres (12 miles) takes 55 minutes or 35 minutes for ordinary ferries and high speed ferries respectively. Ferries operated by Maris Ferry to Aberdeen are also available. Due to inaccessibility to cars and other vehicles, most residents use bicycles for personal transportation, and a number of bicycle rental shops near the ferry pier rent bicycles to tourists. The only vehicles on the island are those used by the emergency services, as well as village vehicles used to transport goods. ^ "普查結果 | 2011年香港人口普查". www.census2011.gov.hk. Retrieved 13 January 2016. ^ "POA School List 97." Hong Kong Education Bureau. Retrieved on 31 March 2019. ^ "Monthly Means of Meteorological Elements for Cheung Chau, 1993-2016". Hong Kong Observatory. Retrieved 8 February 2017. Wikimedia Commons has media related to Cheung Chau.